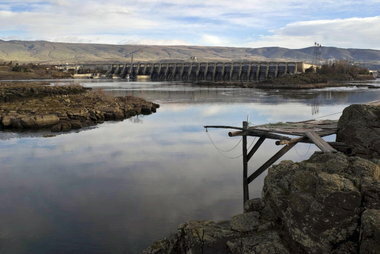 Early March marks a sad anniversary in the history of the mid-Columbia River and its Native American tribes. At 10 a.m. March 10, 1957, the gates of The Dalles Dam closed, and the mighty river's waters quickly inundated Celilo Falls, an area eight miles upstream that, for thousands of years, had been one of the busiest -- and most sacred -- fishing and trading sites in North America. Observers later recalled Native Americans "crying and singing the religious songs that they sing at funerals." Perhaps that's where the ghost came from -- the ghost that keeps after Marv Ross. Several years ago, a Native American elder suggested that a ghost must have gotten ahold of Ross and was compelling him to tell a story about the loss of Celilo Falls and the way of life centered there. Ross is best known as the songwriter and guitarist for Quarterflash, a Portland pop band that scored platinum records in the 1980s, and the guiding force behind folk-music favorites the Trail Band. But beginning in the 1990s, he spent a decade obsessively developing what would become "The Ghosts of Celilo," an innovative and moving work of musical theater that premiered in September 2007 at the Newmark Theatre. The show was a success, earning glowing reviews, selling out most performances and having its run extended. For a while, the ghost that spurred Ross seemed satisfied, even as it came time to remount the musical -- which returns to the Newmark for nine performances, beginning Friday night. But then, Ross says, a familiar feeling returned. "During rehearsals, it started crawling up the back of my neck and now it's got me by both ears again." This ghost brings with it a particular anxiety. There are the usual worries about artistic quality and execution (and musicals, believe it or not, are about as complex and tricky as it gets on those counts). But Ross, though he early on enlisted Native American collaborators on the project, also feels an outsider's burden of responsibility to the subject's cultural sensitivity. "When you spend time around the elders and many other Native people, you find there's still such a well of strong emotions about this issue," he says. "There's a weight to it that I think for non-Natives it's impossible to feel in the same way. For them, this isn't just something that happened 50 years ago, this is something that's still an open wound." Ross latched onto the subject after the state of Oregon commissioned him to create a stage production in honor of the Oregon Trail sesquicentennial, and he became fascinated by the Native American music of the region. He wanted to make that music more accessible by presenting it in a story that related some of the values, beliefs and traditions connected to it. Ross and Tom Hampson, executive director of the Oregon Native American Business Network, interviewed tribal elders around the Columbia River basin. 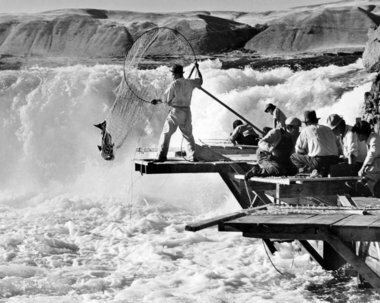 The experiences of a man named Nathan Jim Sr. -- who at age 8 was taken forcibly to the Warm Springs Indian Boarding School and wasn't able to return to Celilo until after the submersion of the falls -- became the basis for "The Ghosts of Celilo." Ross, Hampson, Umatilla musician Thomas Morning Owl and director Greg Tamblyn crafted the story, which moves between the boarding school (where Native American children were forced to abandon their traditional language and culture) and the traditional fishing platforms of Celilo Falls. Ross wrote the book and lyrics, and collaborated on the music with Chenoa Egawa (who also acts in the show), Arlie Neskahi and musical director Mel Kubik. Both in a love story at its core, and a surrounding mystery about spiritual reconciliation, "The Ghosts of Celilo" speaks to cultural conflict and healing. And it does so with songs that make the show's most unlikely blending of elements -- rhythmically complex music of Northwest natives mixed with the nuanced chordal language of show tunes -- seem natural. Most of the principal performers from the 2007 run are involved again. During the earlier production, Noah Hunt, a Lumbee tribe member who plays the lead role of Chokey Jim, was a junior at Hanford High School in Richland, Wash. Now 20, he lives in Los Angeles, where he's pursuing an acting career. But having such a talented Native American actor in the role was so important to Ross that he's been flying Hunt up on weekends to rehearse. Ross was gratified by the response from Native Americans (and others) who attended in '07 but hopes to reach more this time around. Few from Celilo Village itself made it to the last run; this time a group of 65 will see the show on opening weekend, thanks to tickets and transportation paid for by gas company Northwest Natural. If that audience embraces the story, perhaps Ross' ghost will rest at last. Native American Musical 'The Ghosts of Celilo' Returns to Portland's Newmark Theater <-- Watch Video at original site.